Sheet 11 from an unsigned series depicting heroes from the Taiheiki. 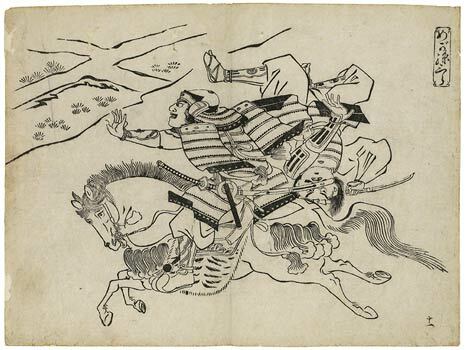 Print from an unsigned series depicting heroic deeds from the Taiheiki, which describes the power struggles in the mid-fourteenth century. In the dramatic scene the famous hero Mega Magosaburō, who was loyal to the emperor, overpowers the young attacker pursuing him. In full gallop he pulls him from his horse with his bare hands, causing the other pursuers to disperse. This leaf belongs to an unsigned series of illustrations from the Taiheiki, which all bear a cartouche in the shape of a tanzaku (leaf of poetry): two further leaves from the Nakajima Collection, also unsigned, have been published. They show Kamakura Gongorô and Tamura-maru, two other heroes from the Taiheiki. The leaves closely resemble a woodblock print in the Michener Collection, Honolulu, which is signed with the name Okumura, Masanobu, and was published by Masanobu himself. The inscription “Mega Magosaburô” enables the hero to be identified. Just how closely the artist kept to the text of the Taiheiki is demonstrated by the following lines of the novel from chapter 8. In order to give an impression of the literature and the illustration, we reproduce them here in full. The scene is set in Kyôto at the time of the capture of the city in the first half of the 14th c. The Taiheiki describes the Civil War of the 14th c. in forty-one volumes. Mega Magosaburô Nagamune from the province Harima, a descendant of Satsuma-no-Ujinaga, was a man of exceptional physical strength. At the age of about twelve, he began to practice sumô combat and was later able to beat every opponent in the whole land with one hand. It is said that people of the same type come together naturally. Thus it was that the other men of his clan, seventeen in all, were all stronger than normal people. Together they formed a fighting band, without a single foreign warrior in their rank, which succeeded in advancing to the crossroads of the Rokujôhômon and Ômiya roads (in Kyôto). There they came across three thousand horsemen of the Rokuhara Company, who were just returning victoriously from battles at the Tôji Temple and near Takeda. The Rokuhara men surrounded them and killed all seventeen; only Magosaburô was left. “There would be no point in living any longer, if the Emperor’s interests were not now more important, “ he said to himself. “Even though I along have been left alive, I can still serve my master.” Thereupon he tried to flee on horseback in a westerly direction, but a troop of fifty horsemen followed him. One of these, a young warrior of about twenty, caught up with the fleeing hero on his own, rode right up to him and wanted to draw him into a hand-to-hand fight on horseback. But no sooner had he succeeded in getting hold of the protective arm-covering of Magosaburô’s armour than the latter for his part effortlessly stretched out his arm, grabbed the youth by his armour, lifted him up, and rode on with him thus a good three hundred meters. “Spare his life!” cried the other fifty and went after him, for the youth was from a good warrior family. But Magosaburô turned half back to look at them and said: “Not all enemies are the same. If you imagine you can attack me easily because I am alone, then you are mistaken. But if you want this one here back, you can have him!” With these words he took the warrior, who was hanging in full armour from his left arm, in his right hand and threw him over the heads of the six horsemen following him, into the deep mud of a rice-field, where he sank almost completely. At this sight, the fifty riders turned their horses around and hurried away at top speed.